Eastwood spoke at the Fianna Fáil Ard Fheis in Citywest Hotel. THE LEADER OF the SDLP has strongly criticised Sinn Féin after a tweet by the party edited a portion of his speech to the Fianna Fáil Ard Fheis mid-sentence. 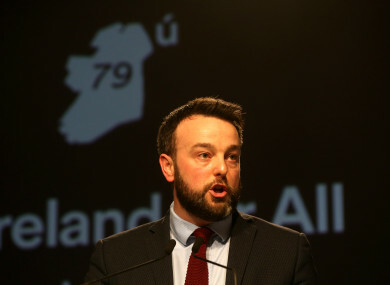 Colum Eastwood spoke at Fianna Fáil’s national conference on Saturday and argued that a border poll should only be held after the “definition and detail” of a “New Ireland” is provided. In doing so, Eastwood referenced the recent comments by Donald Tusk, who had said there may be a “special place in hell” for those who promoted Brexit “without a plan”. There will be a special place reserved in hell for those who call for a border poll in Ireland with no plan or no idea to actually win it. In a video posted last night, Sinn Féin’s official Twitter account shared a video of Eastwood delivering that sentence but cut his words before the end of the sentence. At the @fiannafailparty Ard Fheis last Saturday, @SDLPlive Leader Colum Eastwood got a standing ovation from the crowd after saying that there's a special place in Hell for people who call for a border poll on Irish Unity. Responding to Sinn Féin’s tweet, Eastwood said that the party was twisting his words. “You have left out the bit when I said – “without a plan to win it”. But don’t let the truth get in the way of a good story. You never do,” Eastwood tweeted. Another SDLP representative, councillor Malachy Quinn, said that Sinn Féin was “getting desperate”. “To deliberately edit a speech to change its meaning is something Trump wouldn’t even do. But then again… facts were never friends to SF,” Quinn tweeted. This evening, Fianna Fáil has mocked Sinn Féin’s tweet with an edited video of Mary Lou McDonald, stating that Sinn Féin edited Eastwood’s speech to “change its meaning and make a political charge”. Wow, some really subtle editing work here from SF’s Internet Research Agency. They’ve edited @columeastwood speech to change its meaning & make a political charge. What sort of political genius is this? Email “Sinn Féin accused of 'getting desperate' by tweeting edited version of SDLP leader's speech”. Feedback on “Sinn Féin accused of 'getting desperate' by tweeting edited version of SDLP leader's speech”.